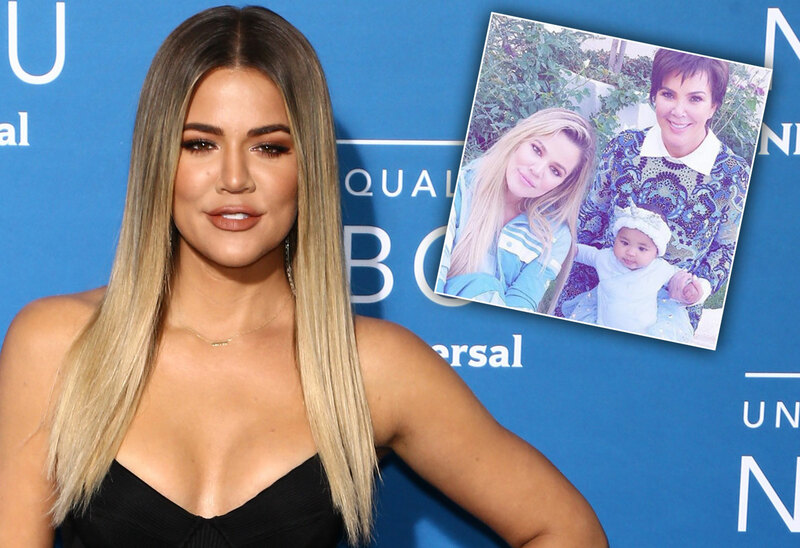 Baby True Thompson is six months old, and it looks like mom Khloe Kardashian pulled most of the Kardashian clan together to celebrate. The KUWTK star shared a sweet snap of herself with her little one and grandma Kris Jenner at the party that paid tribute to the woman who raised her. She posted it in spite of the drama around her filtering True. Click through the gallery to see the adorable shot and to find out who was — and wasn’t — at the party! Khloe, 34, posted a photo of herself with True, who was dressed like a unicorn, and Kris, 62, who was helping the baby stand. She wrote in the caption, "Thank you does not begin to describe the amount of respect, appreciation and LOVE that I have for you, but I do need you to know that you are my hero. I hope to live up to the mom you have been to us. (Regardless of what Kourt thinks JK lol) seriously, how did WE get so lucky to have you? WE have the cheat codes to mommy-hood." She continued in the lengthy post, "Thank you for being selfless. You continuously put us before yourself and you never think twice about it. (Except when it comes to paid Instagram posts but I ain’t mad at you for gettin that money honey). Thank you for being one of my very best friends, but most of all, thank you for being my mommy. If I could, I would choose you a million times!!" Kourtney, 39, didn't seem to appreciate the pot shot. She wrote in the comments, "I love you too mommy (regardless of what Khloé thinks)." That's not quite sisterly love. Kylie Jenner, 21, chimed in with love for Kris too. Both Kourtney and Kylie were missing from the party — as was baby Stormi. Kim Kardashian, 37, left her mom a string of hearts. She was at Khloe's party, and it seemed she brought North, Saint, and Chicago with her. Khloe's grandma MJ also took a cute photo with True yesterday, October 18. She was loving hanging out with her great-grandmother. Kourtney's ex Scott Disick brought Reign and Penelope to the party. It seemed eldest son Mason didn't want to hang with the little ones. Kim and Khloe shared photos of their kids and nieces and nephews on Instagram. Even Rob Kardashian's daughter Dream made the trip, though if their brother was present, he stayed off camera. It's good Khloe had a chance to be around her family since she's had so much drama in her life lately. She's still figuring out her future — or lack thereof — with baby daddy Tristan Thompson. The Good American designer has also received criticism from fans for filtering and air brushing photos of True. It seems the photos from the party were less re-touched, though. What do you think of Khloe's unicorn party? Let us know in the comments!